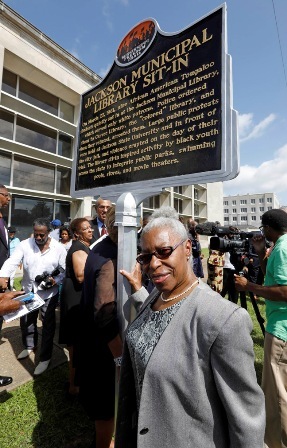 Mississippi has dedicated a new historical marker honoring African-American students who challenged segregation at a public library in 1961. Eight of the “Tougaloo Nine” are still living, and seven attended a ceremony Thursday to unveil the marker in downtown Jackson. It is the 25th entry on the Mississippi Freedom Trail — a series of signs commemorating people and sites significant to the civil rights movement. The students attended the private Tougaloo College, just north of Jackson, when they staged a nonviolent sit-in at the city’s main library that was reserved for white people. Mississippi NAACP leader Medgar Evers worked with the students to plan the sit-in. The four women and five men were charged with breach of peace and spent 32 hours in jail. Each was convicted, fined $100 and given a 30-day suspended jail sentence. The case was later dismissed on appeal. “We could not have done it individually. We had to do it as a group,” said Geraldine Edwards Hollis, one of the nine. Another of the former students, Janice Jackson Vails, said she does not remember being scared to participate in the library sit-in. During a panel discussion Thursday, she drew gasps from several dozen people in the audience as she said one of the police officers who had arrested her called her later in her dorm and asked her out on a date. This was two years before Jackson hired its first black officers. Evers, who led voter-registration drives and other challenges to Mississippi’s segregated society, was assassinated in Jackson in 1963. A self-professed white supremacist was convicted of the slaying in 1994.